Giveaway! Enter to Win this AWESOME Kitchen Gadget! AND THE WINNER IS….. Becky Hilsabeck Sharp. Congrats, Becky! Please email me within 48 hours (Thursday morning) with your address to claim your prize. Guess what? It’s a GIVEAWAY! I asked my facebook fans to vote for an awesome prize (join me on Facebook so you can be involved in the selection process next time, AND get my awesome tips and updates), and the awesome prize is this Cuisinart Mini Prep Food Processor! This tool will make cooking so much easier and much more fun. I love mine! Enter to win, and good luck! 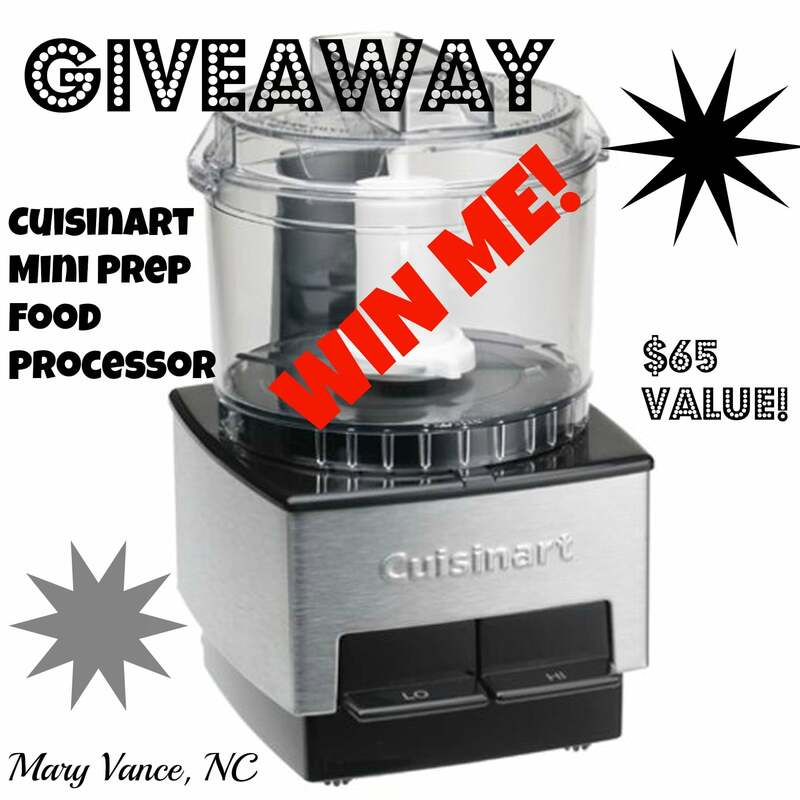 Click the link for the Cuisinart Mini Prep Food Processor to check out the awesome prize. Use the Rafflecopter widget below to enter. It’s easy to enter in the drawing to win. *Subscribe to my newsletter below (required). You must be subscribed to win. *You can earn bonus entries for liking/sharing my Facebook page, sharing the giveaway on Pinterest, following me on Twitter, and tweeting about the giveaway. Giveaway begins Monday, August 12th, 2013, at 7am PST. Giveaway ends Monday, August 19th, 2013, at 7pm PST. Winner will be announced on my site, www.maryvancenc.com, on Tuesday, August 20th. The winner will be chosen at random by Rafflecopter. Be sure to check back on Tuesday, 8/20/13 to see if you are the WINNER! The winner will have 48 hours to respond by email. This giveaway is open to U.S. residents only. Void where prohibited. GOOD LUCK! It won’t let me “pin” the image. Would sooo love to win this kitchen helper! I have “Pin It” on my Bookmarks Bar. Just click on it to post to pinterest. If you do not have it you should download it cause I have used it so much because of broken images on web pages.